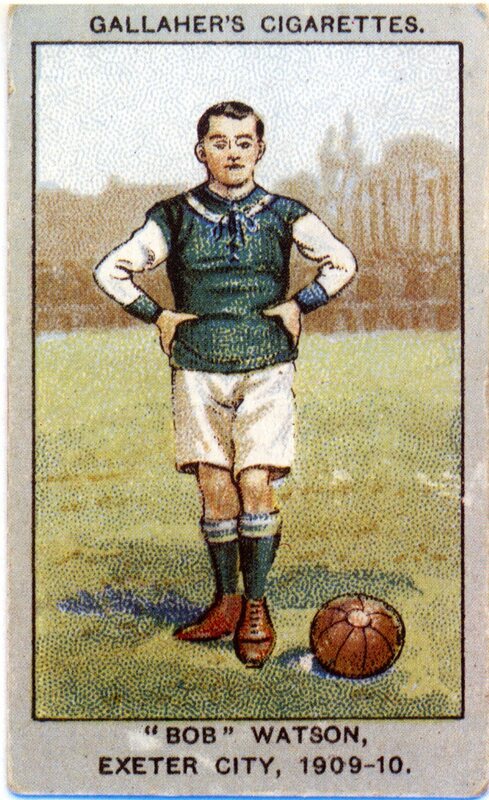 The selected image comes from a cigarette card, which was first purchased in 1909. The picture is that of inside forward ‘Bob’ Watson, who played for and captained the club between 1908 & 1912. Perhaps to the horror of many, Bob seems to be wearing the shirt of our rivals Plymouth Argyle, but in actual fact this is one of the first home shirts worn by ECFC. The choice of design had no connection our old foes down the road, but more to do with the colours of the county flag and that of City’s founding members, St Sidwell’s Fc. However, in 1910 the players felt that this choice of strip was unlucky, and the decision was made mid-season, to change to the more familiar outfit of red and white stripes. The shirt made its debut in a match against West Ham United. This contest ended in a goalless draw, but 5 wins on the bounce followed to end the winless streak and the colours stayed. In the post war years, City abandoned the stripes in favour of hoops, before changing to an Arsenal inspired red shirt with white trim for much of the 1950’s. 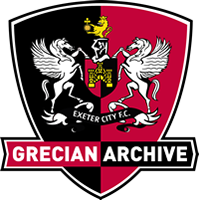 Moving on to 1964 and the design was closer to that of Liverpool FC, a move which seems fitting as Liverpudlian marksmen Alan banks spearheaded Exeter’s first successful promotion campaign in the football league. In the late sixties the stripes returned, and have been worn in various widths and styles by both players and fans during the course of many of the major events of the last 45 years.